Lobos strikes again, this time helping the Fayette County Sheriff's Office seize an estimated $775,000 in methamphetamine. 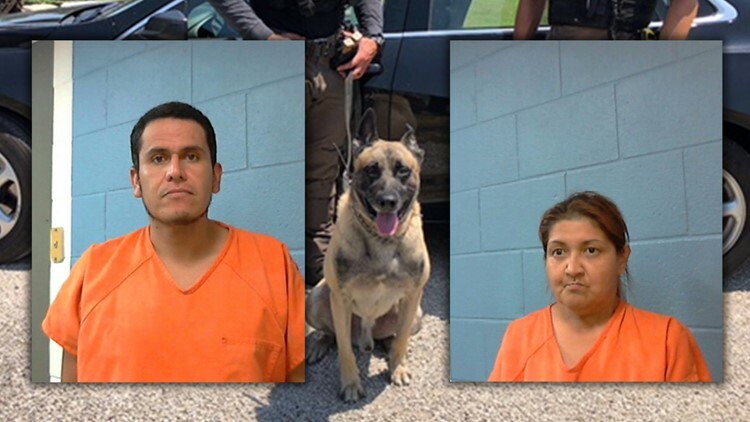 FAYETTE COUNTY, Texas — When it comes to busting drugs in Fayette County, no canine does it better than Lobos. According to the Fayette County Sheriff's Office, Drug Interdiction Sgt. Randy Thumann and his canine, Lobos, conducted a traffic stop on I-10 near Flatonia late Friday morning. That stop yielded the discovery of about $775,000 in methamphetamine, thanks to Lobos. Drug Interdiction Investigator David Smith also assisted. Officials reported that once the 2018 Chevrolet Malibu was stopped for a traffic violation, the driver exhibited "very nervous" behavior and gave consent for officials to search his vehicle. When Lobos was deployed to conduct an exterior sweep, he alerted to an odor on the interior of the vehicle. The sheriff's office said that three small bags of meth and a pipe were discovered on the passenger floor. Additionally, 17 pounds of crystal meth was found in a suitcase discovered in the trunk, officials reported. The driver, 36-year-old Marco Felix Ruizsoria of Azusa, California, and passenger, 41-year-old Belinda Rios of Visalia, California, were both arrested. The sheriff's office reported they were transported to the Dan R. Beck Justice Center and charged with felony possession of a controlled substance.